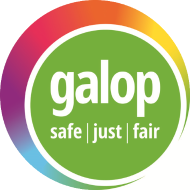 Galop is London’s LGBT anti-violence & abuse charity. We give advice and support to people who have experienced biphobia, homophobia, transphobia, sexual violence or domestic abuse. We also support lesbian, gay, bi, trans and queer people who have had problems with the police or have questions about the criminal justice system. We are a completely independent community-led group and we are not connected to the police. You can contact us anonymously if you choose.